Organising your own 3 peaks challenge and want to learn some navigation for the challenge? See why it's safer to do your 3 peaks challenge with experienced guides. This walk involves a circuit of the high ground around Small Water and Blea Water above Mardale Head in the Eastern part of the district, visiting the summits of 3 mountains on the way - Harter Fell, Mardale Ill Bell and High Street. 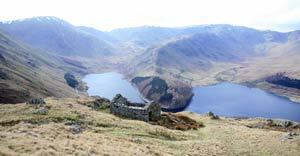 Mardale Head is situated at the end of Haweswater and is the starting point for this circular route. The route can be done either way but we describe it here in a clockwise direction. 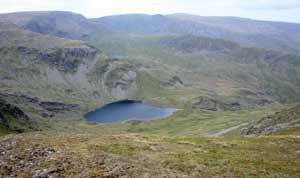 Haweswater was enlarged many years ago to form a reservoir to supply water to the conurbations of Manchester. The village of Mardale Green was demolished to make way for the enlargement of the lake. In conditions of drought when the water level falls significantly the walls and former roads emerge from below the water as a reminder that a once thriving community used to be here.The valley is now uninhabited apart from the Haweswater hotel which was built to replace the demolished Inn at mardale Green. The route starts at the car park at Mardale Head and follows a well worn track to Small Water, nestling on a raised shelf below Harter Fell. Small Water can appear bleak and forboding on any day but can be positively uninviting on a stormy day. Surrounded by steep slopes and crags it always seems dark and is in shade for most of the day. We follow the track to the right and pass a series of small stone shelters built many years ago to afford respite from the elements for travellers between Mardale and Kentmere. From Small Water we ascend to Nan Bield Pass on the skyline between Harter Fell and Mardale Ill Bell. We turn left to Harter Fell and visit the summit before retracing our steps to Nan Bield Pass and heading for our second top Mardale Ill Bell. Mardale Ill Bell can be a confusing area in mist and is ccrossed by many without realising it as they make their way to High Street. High Street is flat and featureless but makes for easy walking. 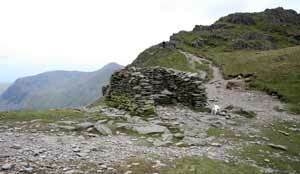 Having visited the summit we descend to our starting point at Mardale Head via Long Stile and Rough Crag. This is the long arm that is seen to stretch out from High Street's summit all the way down to the shore of Haweswater.